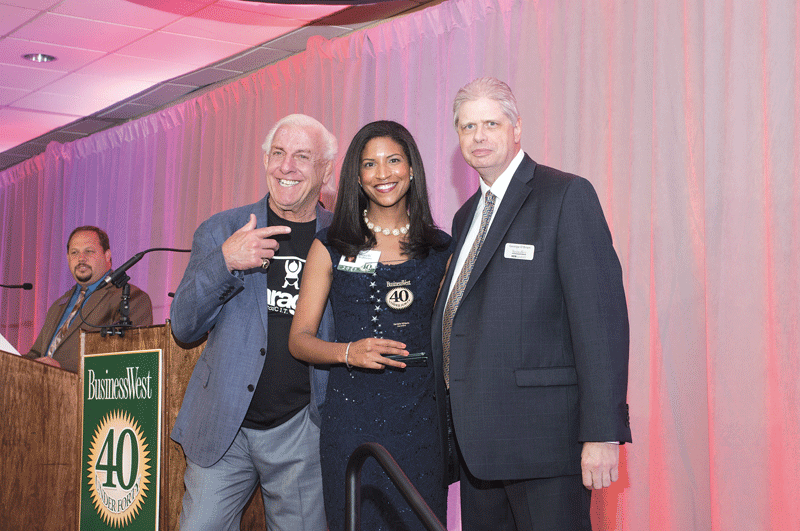 The ninth annual 40 Under Forty class of 2015 celebrated their big night on June 18 with style, class, and Flair — as in wrestling legend Ric Flair, a guest of presenting sponsor Paragus Strategic IT, who delivered brief, heartfelt words to this year’s assembly of high achievers, and a standing-room-only crowd of supporters, at the Log Cabin in Holyoke. Paragus was in the spotlight in another way, as CEO Delcie Bean (40 Under Forty class of 2008) won BusinessWest’s inaugural Continued Excellence Award (see photo at right), sponsored by Northwestern Mutual and presented by Kate Kane, managing director of its Springfield office, and BusinessWest Editor George O’Brien. 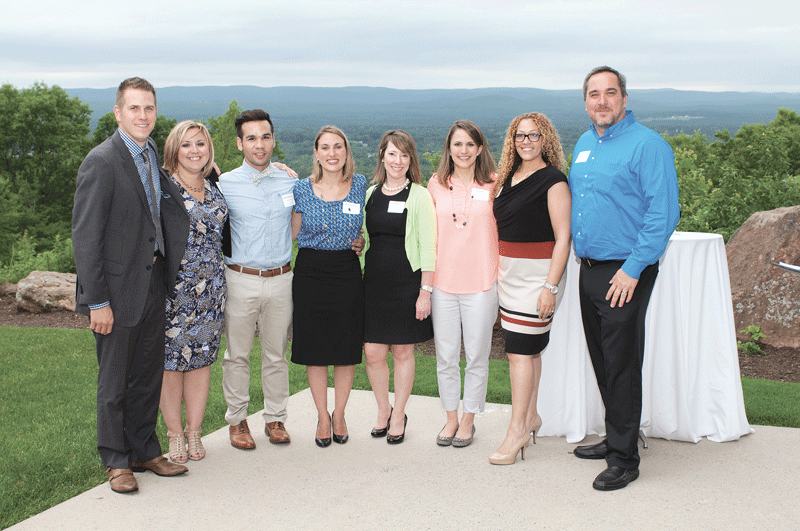 But the night belonged to members of the class of 2015, who proved, yet again, that this region has no shortage of young professionals who are making an impact in business and in the community. Below, we present some scenes from a memorable, exuberant evening. 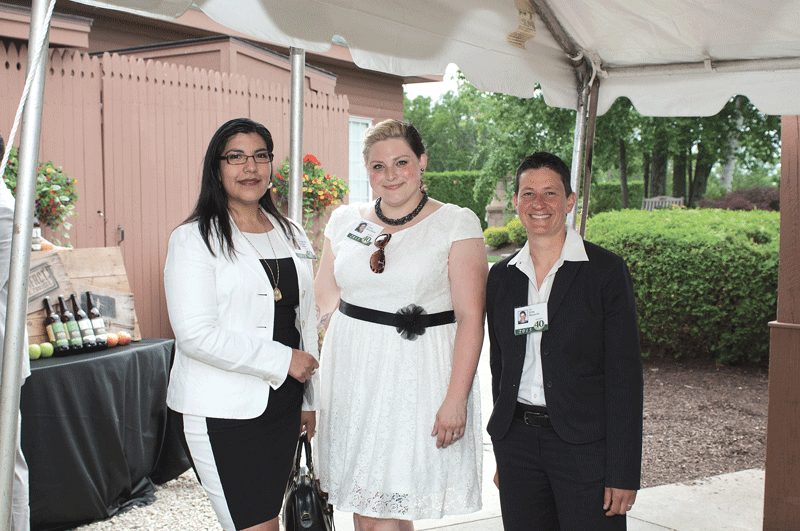 From left: class of 2015 honorees Elizabeth Barajas-Roman, CEO, Women’s Fund of Massachusetts; Terra Missildine; owner and operations manager, Beloved Earth Co.; and Erin Buzuvis, professor of Law and director of the Center for Gender & Sexuality Studies, Western New England University School of Law. 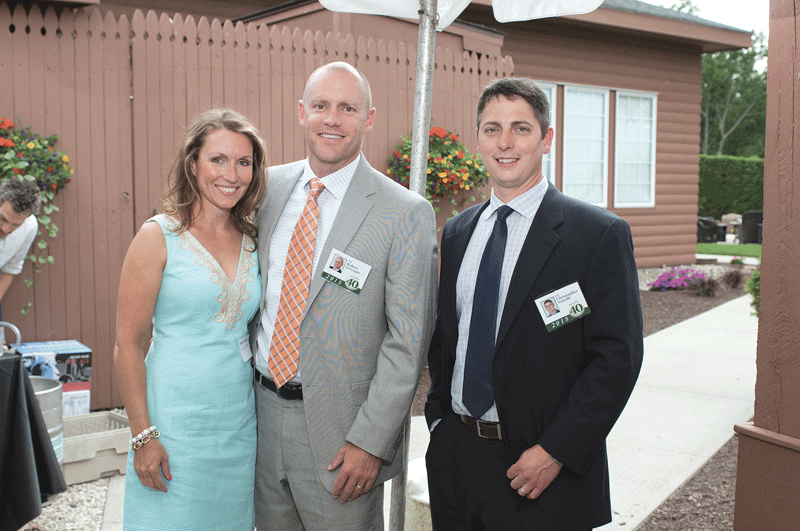 From left: Jennifer Levesque, operations manager, R. Levesque Associates; with her husband, Robert Levesque (class of 2015), president, R. Levesque Associates; and Christopher Novelli (class of 2015), architect, Studio One Inc.
From left: class of 2015 honorees Dr. Anthony Sarage, pediatric surgeon, Western Massachusetts Podiatric Associates; Jim Angelos, owner and executive director, InspireWorks Enrichment Inc.; Gregg Desmarais, vice president and store manager, TD Bank; Kate Lockhart, development director, Big Brothers Big Sisters of Hampden County; A.J. Crane, co-owner and partner, A. Crane Construction; Terra Missildine; owner and operations manager, Beloved Earth Co.; Jennifer Gallant, chief financial officer, Polish National Credit Union; and Patrick Davis, operations manager, CRD Metalworks, LLC. Joel Mollison (class of 2015), president, Northeast IT Systems; with his fiancée, Christine Gryknkiewicz, respiratory therapist, Cooley Dickinson Hospital. From left: Marcelia Muehlke (class of 2015), owner, Celia Grace Wedding Dresses; and Sarah Shube, owner, Creative Art Therapies. 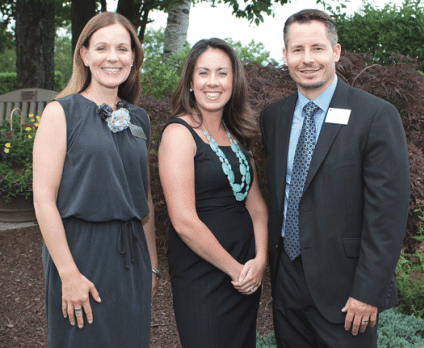 From the Isenberg School of Management at UMass Amherst, a 40 Under Forty sponsor, from left: Jennifer Meunier, director of Business Development; Trista Hevey, director of Alumni Corporate Relations; and Kyle Bate, academic advisor. 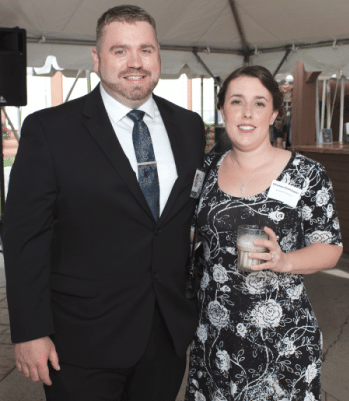 Sarah Williams (class of 2015), vice president of Global Risk Management, MassMutual Financial Group; with her husband, Richard Williams, investigator, Investigators LLC. 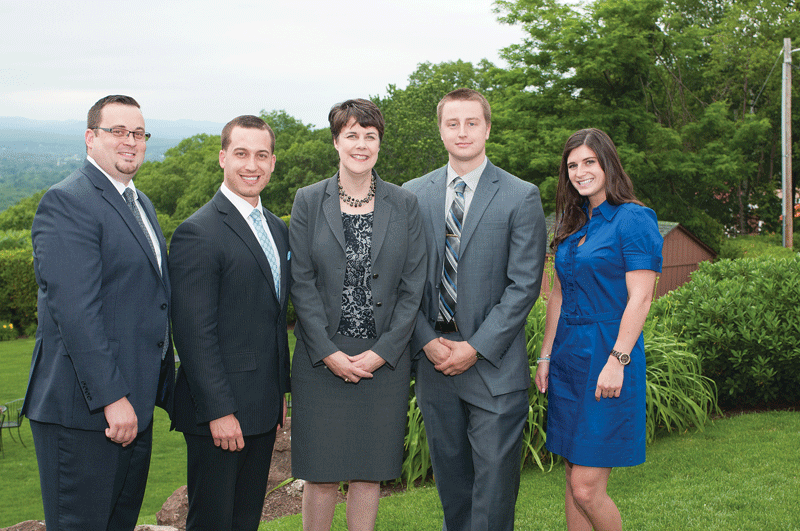 From Northwestern Mutual, presenting sponsor of 40 Under Forty, from left: Tim Steffen, director of recruitment; Nico Sananiello, financial advisor; Kate Kane, managing director; Rob Walker, financial representative; and Taylor Hassa, financial representative. 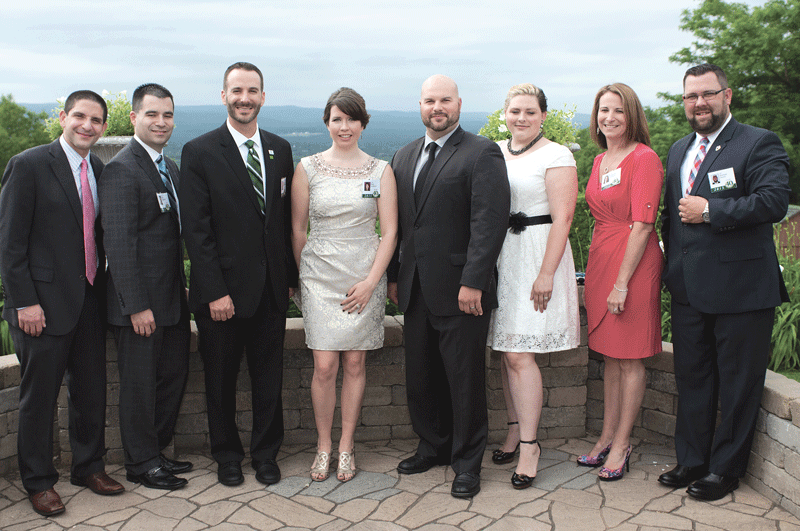 From Paragus Strategic IT, presenting sponsor of 40 Under Forty, from left: Lisa Lococo, office manager; Delcie Bean IV, CEO; Dave DeRicco, account representative; Anthony Schiappa, account representative; Tyler Lucas, COO; Sarah Powers, financial administration; and Margie LaMotte, executive assistant to the CEO. 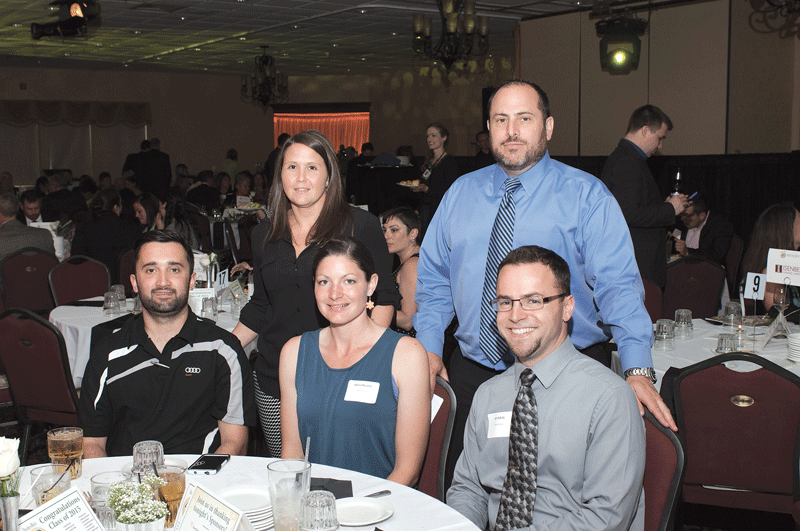 From Fathers and Sons, a 40 Under Forty sponsor, from left: Bill Visneau, sales associate; Marissa Monti, business manager; Shera Rosarario, sales associate; Steven Langieri, sales manager; and Jon Schulz, sales associate. 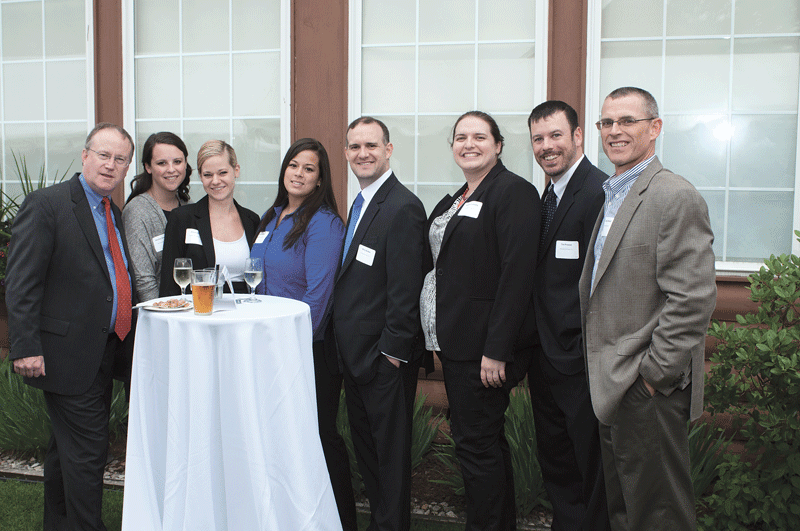 From Moriarty & Primack, P.C., a 40 Under Forty sponsor, from left: Tax Director Bob Supernaut; Tax Associate Shelley Sheridan; Audit Associate Jessica Peet; Tax Associates Laurie Bonan and Chris Walker; Manager Rebecca Connelly, Tax Manager Tim Prozost; and Partner Doug Theobold. 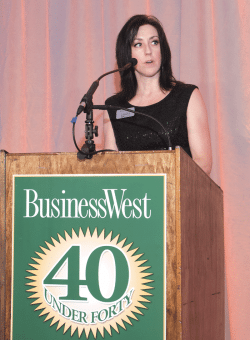 Kate Campiti, associate publisher, BusinessWest, welcomes the more than 650 attendees of the ninth annual 40 Under Forty gala. 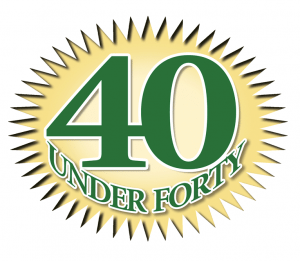 Joseph Bednar, senior writer, BusinessWest; and Denise Hurst (class of 2014), quality improvement manager and human rights coordinator, Department of Mental Health, and vice chair, Springfield School Committee, get ready to welcome this year’s 40 Under Forty honorees to the stage. 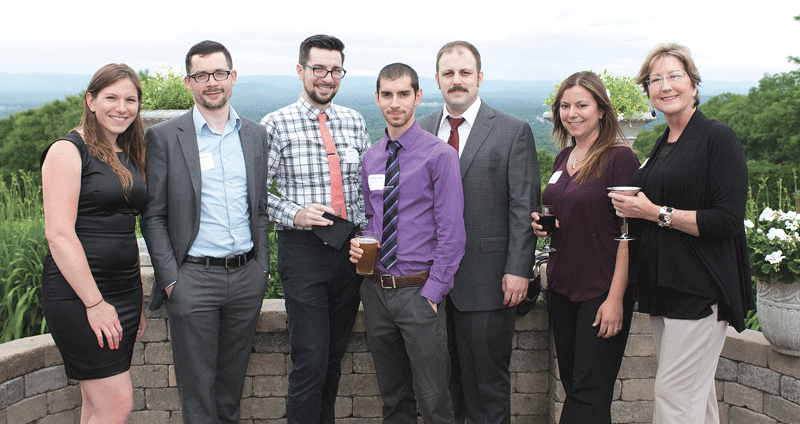 From Health New England, a 40 Under Forty sponsor, from left: Steven Webster, director of marketing and digital strategy; Jessica Dupont, risk adjustment manager; Robert Ravenscroft, clinical healthcare analyst; Nicole Santaniello, content management specialist; Sandi Bascove, marketing operations manager; Elaine Mann, marketing content strategy manager; Yvonne Diaz, account executive, existing business; and Patrick McColley, UX/CX architect manager. 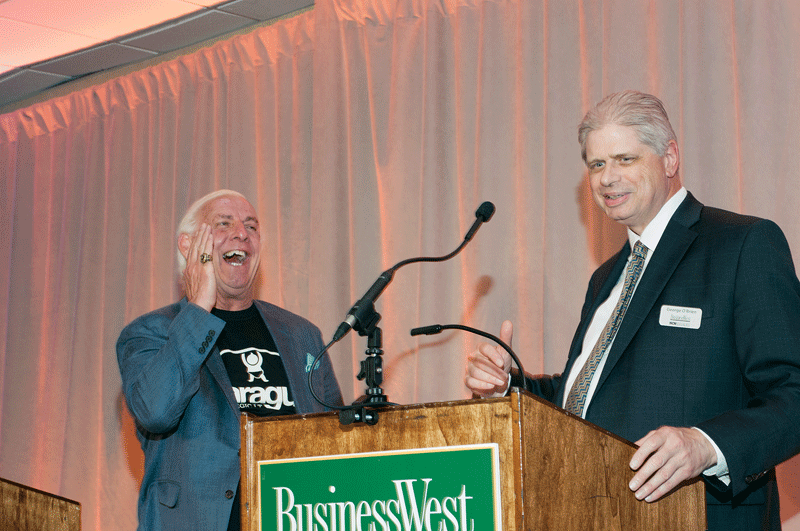 George O’Brien, editor, BusinessWest, shares a laugh with wrestling legend ‘Nature Boy’ Ric Flair, a special guest of 40 Under Forty presenting sponsor Paragus Strategic IT. George O’Brien and Ric Flair shared the privilege of presenting awards to the class of 2015, including, from top to bottom, Eric Devine, Information Technology Services officer, Country Bank for Savings; Jessica Fraga, continuous improvement consultant, MassMutual Financial Group; and Danielle Williams, attorney, Fierst, Kane & Bloomberg LLP. The NextGEN gallery with ID/slug: 12 does not exist or is empty. 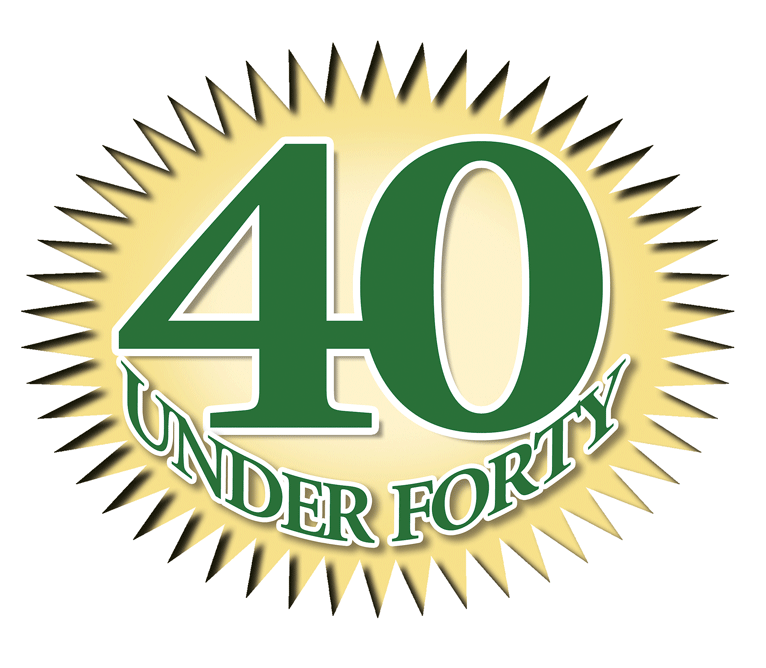 That’s a word that could be used to describe any of BusinessWest’s classes of 40 Under Forty winners. But with the class of 2015 (see the list below), an adverb like ‘very’ or ‘extremely’ would sem to be necessary. That’s because this group of winners represents virtually every sector of the economy — from financial services to manufacturing; retail to healthcare; technology to nonprofit management; education to law. They also show the seemingly innumerable ways to give back to the community — from serving as a Big Sister to teaching young girls how to cheer; from service on nonprofit boards to work repairing homes in Springfield’s neighborhoods; from taking a leadership role in an Extreme Makeover project to service on the town of Orange’s School Building Committee (see the profiles of the five judge’s HERE). Tickets to the gala are $65 each, with tables of 10 still available. Tickets can be ordered by calling (413) 781-8600, ext. 100, for more information go HERE. That was the word Joel Morse, associate director of Corporate Support for WGBY, summoned repeatedly as he nominated Kate Lockhart for inclusion in the 40 Under Forty Class of 2015. He didn’t use it in the context of her work as development director of Big Brothers Big Sisters of Hampshire County (BBBS), although that was implied. Rather, he deployed it to describe all that she has accomplished at age 24 and how she continues to inspire people with her energy, imagination, and commitment to the community. Lockhart, a UMass Amherst graduate who interned at BBBS in 2013, has become, in many respects, the face of the agency in Hampshire County. She coordinates its four annual fund-raisers, including the hugely successful bowl-a-thon, handles public relations and marketing, works with individual donors, and represents the organization at chamber events and other functions. In short, she plays a huge role in creating, facilitating, and nurturing the many types of relationships, especially those within the business community, that BBBS needs to meet its mission of serving at-risk young people. She’s also a Big Sister, or ‘big,’ as they’re called, to Karen, age 10, her ‘little,’ despite being only two years out of college. Lockhart, who has been involved with nonprofits since her years at UMass, is active within the community on many levels. She is the founder and co-president of the Young Professionals of Amherst, and recently joined the board of the Amherst chamber. She is also on the Winterfest committee of the Friends of Amherst Leisure Services and Supplemental Education. She is also active with the UMass Alumni Assoc., and is presently part of the Women’s Fund’s Leadership Institute for Political and Public Impact. It’s a level of civic commitment that is, well, extraordinary. Chris Desrosiers remembers Hadley Printing — the small, one-man shop started by his grandfather, Alexander, and then acquired by his his father, Mark, and uncle, Dean — being a huge part of his life growing up. He recalls being at the shop handling odd chores while in grade school, before graduating to more serious roles on the production floor during summers in high school. But he never intended to be part of any third-generation ownership team. In fact, after graduating from the Rochester Institute of Technology and its printing management program, he went to work for a printer in Boston. Everything changed, however, in 2003, when Dean decided he wanted to sell his ownership stake in the company. Chris saw this as a unique, and unanticipated, opportunity to return to Western Mass. and scratch an entrepreneurial itch, and he partnered with his brother, Greg, to acquire those shares. 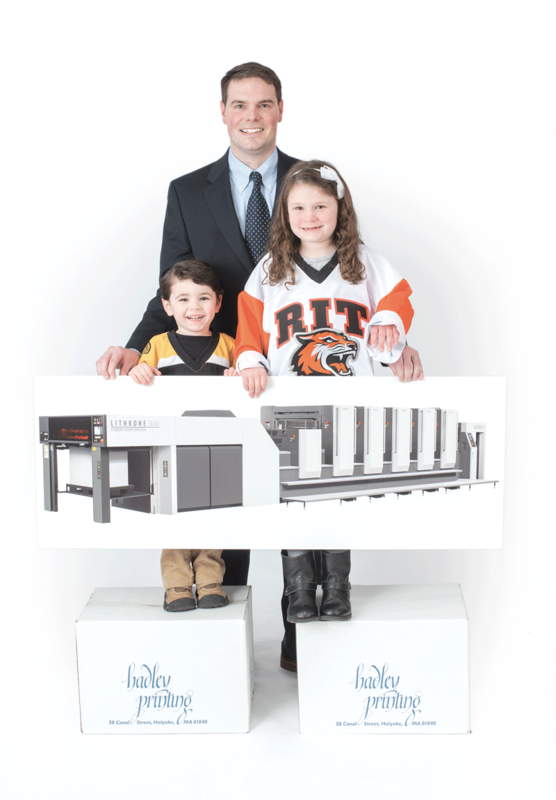 A decade later, they completed the acquisition, buying out their father, and today they’re full partners in a business that is setting the tone in a changing, increasingly competitive printing industry. While Greg is focused primarily on sales and marketing, Chris is involved with operations, and he played a huge role in expanding the company’s services to the larger-scale printing projects demanded by many commercial customers, thus helping it double sales since 2003. He’s expecting a similar return on investment from the time and energy he’s contributing to efforts to groom the next generation of printing professionals, through his involvement with Dean Technical High School and its graphic communications program. Sarah Williams acknowledged that it’s not easy explaining — in layman’s terms, anyway — exactly what she does as vice president of Global Capital Risk for MassMutual. Williams, who came to MassMutual roughly a year ago after a lengthy stint at the Hartford, where she handled a variety of roles, provided an effective translation to that synopsis. This is a job that takes her abroad at least a few times a year — she recently returned from Rome, for example, and has made trips to Switzerland, Canada, and the Netherlands in recent months — and to Washington, D.C. frequently. There is little time for sightseeing, however, she said, adding that this is definitely business travel. 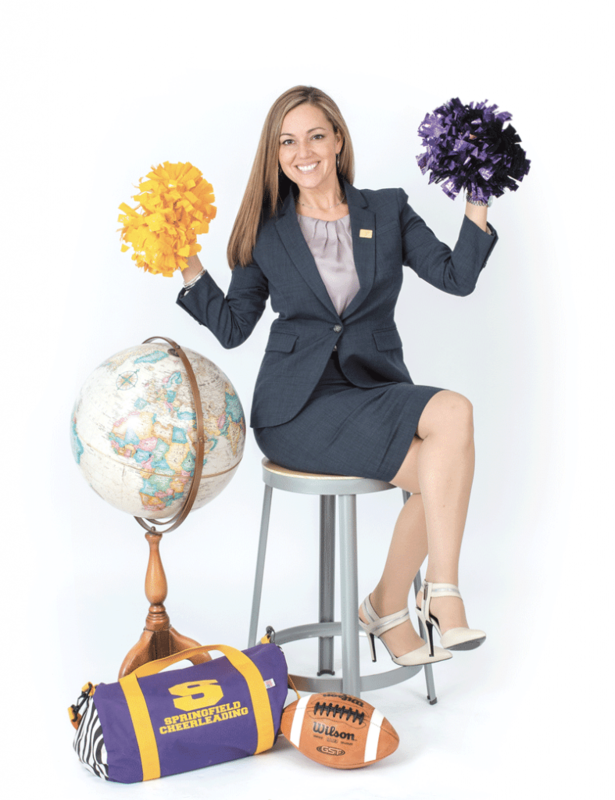 With regard to the former, she is treasurer and immediate past president of the corporate board for the YMCA of Greater Springfield, and also leads Springfield Youth Cheerleading, an organization devoted to promoting and teaching that activity. As for the latter, well, the cheerleading is part of it, but this family also watches and plays the game. Indeed, Williams’ husband, Richard, is offensive-line coach at Springfield’s Central High School, while her sons and stepson all played for Central, and her youngest son is the projected starting quarterback at Monmouth University in New Jersey next season. Robert Levesque has always loved to work. “I’ve never had a job I didn’t like,” he told BusinessWest, adding that he comes from a family of entrepreneurs and co-founded R. Levesque Associates Inc. in 2001 with his father, Raymond Levesque. His dad died from cancer — which led Robert to become a board member at the Cancer House of Hope — but the company has thrived, and he takes his great satisfaction in helping clients develop innovative, environmentally sound, and cost-effective projects that promote sustainable development. 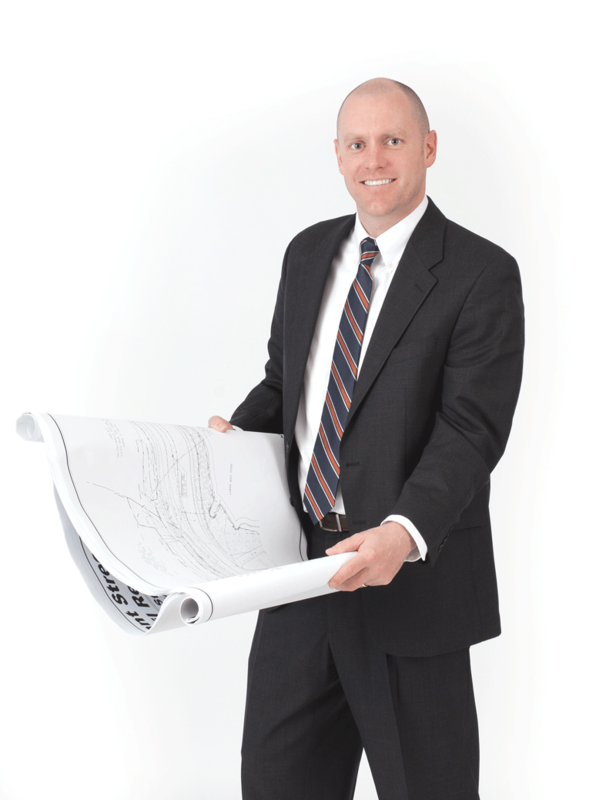 “I love the excitement, challenge, creativity, and problem solving related to the use of land and its development,” he said, as he explained how he helps clients navigate the quagmire of local, state, and federal regulations required to achieve their goals. “We’ve gone from working out of a walk-out basement to a business with 16 employees, and have acquired two buildings and two small businesses — Ecotec and D.L. Bean Engineers and Surveyors,” he said. Although he believes in organic growth, quality is extremely important to him, and he is proud to provide affordable solutions to people working with their own money. Levesque and his wife Jennifer are parents to 9-year-old Aiden, 8-year-old Payton, and 5-year-old Ryann. “My wife is very motivated and is a huge support to me in everything, including the business,” he said. Levesque is on the board of the Greater Springfield Habitat for Humanity Restore Committee and the Westfield School Building Committee. He is a corporator for Westfield Atheneum and a former board member of the city of Westfield’s Industrial Development Corp. and the Greater Westfield Chamber of Commerce. 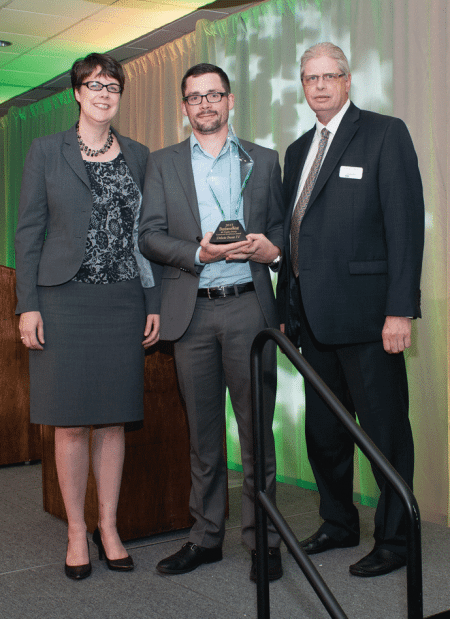 His company was chosen as the 2014 Greater Westfield Chamber Business of the Year, and Mayor Daniel Knapik presented him with a commendation naming him Business Man of the Year. But his passion is Stanley Park, and he sits on its board of directors. Gregg Desmarais knows that everyone faces challenges and obstacles in life. 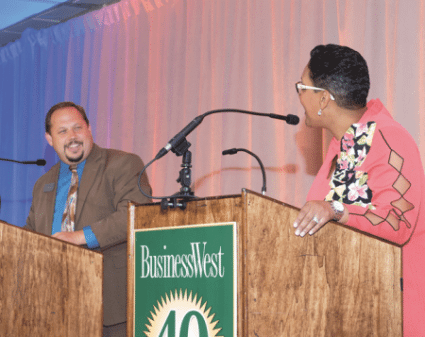 “But I tend to see the silver lining in things and try to change bad situations into good ones,” he told BusinessWest. Last April, he recruited a team of volunteers from TD Bank to landscape and paint an elderly widow’s home during the Revitalize Community Development Corp.’s National Rebuilding Day. They were unable to finish their work due to freezing rain and bitter cold, but he convinced them to volunteer again the following Saturday. “It’s so rewarding. I take advantage of any opportunity I can to get out of my suit and tie, get my hands dirty, and give back to the community. 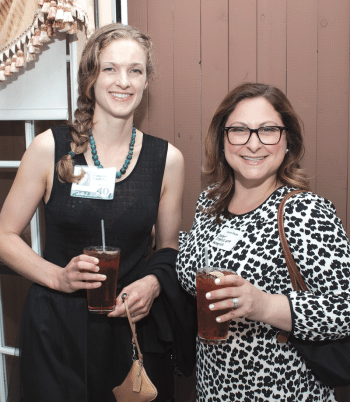 I want to make Springfield as healthy, safe, and beautiful as it can be,” said the RCDC board member, who served as chairperson for three years during the Community Foundation’s annual Valley Gives fund-raiser. 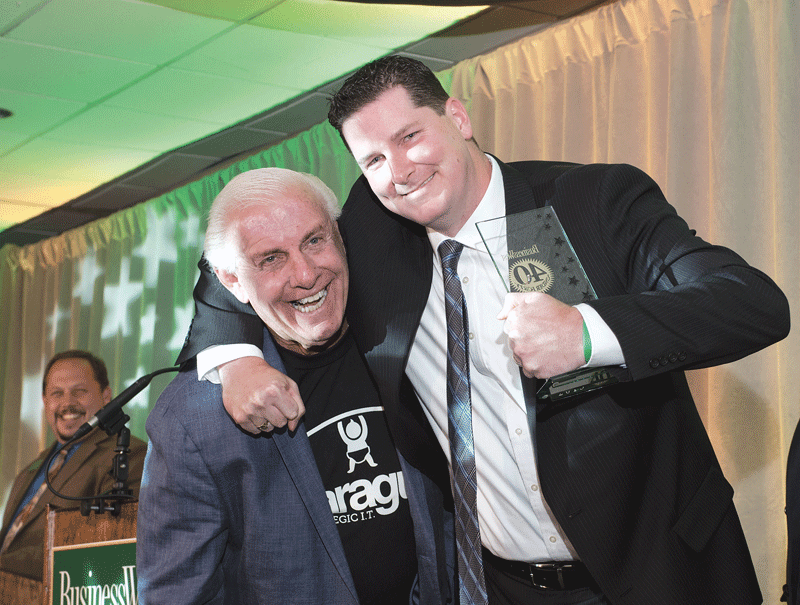 Desmarais’ dedication and passion for people have helped him succeed at TD Bank. 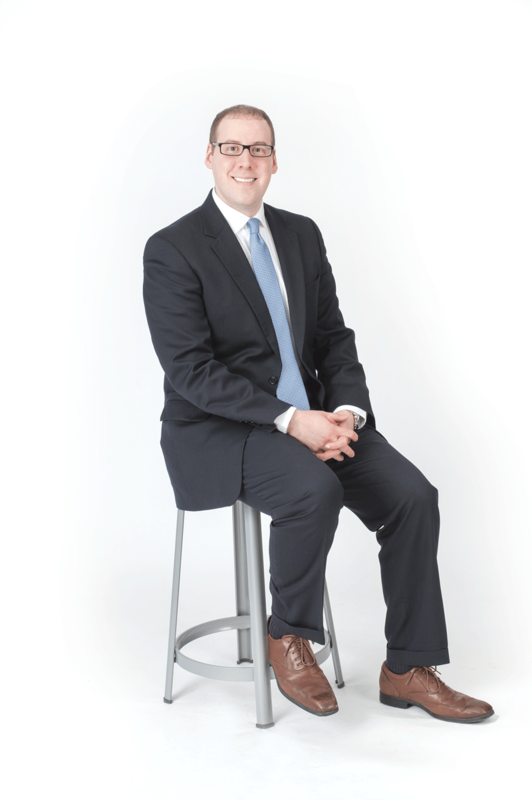 He started four years ago as an assistant store manager in Agawam, was promoted to manager and assistant vice president of his hometown bank in Westfield, and was later chosen to lead the institution’s flagship office in downtown Springfield in 2013. Since that time, he has been assigned to high-profile projects and won many accolades. He was a 2012 TD Bank nominee for the CEO Leadership Award; feted as a TD Bank Top Performer in 2012, 2013, and 2014; and selected to attend the bank’s prestigious TD Leadership Training Program. Desmarais also earned two quarterly ‘Wow Stars,’ which recognize top performers in specific areas within a seven-region area with more than 100 offices. He said his parents instilled a strong work ethic in him, and family is his highest priority. 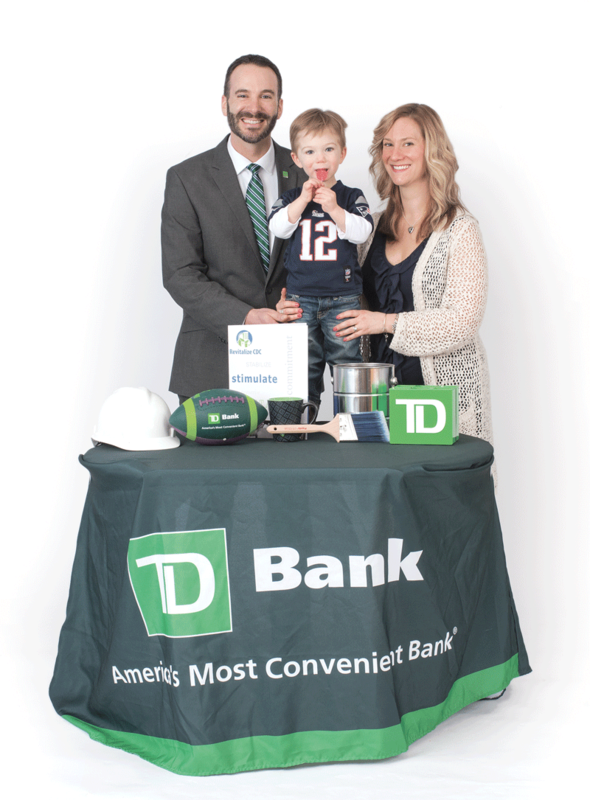 He and his wife Michelle are parents to 2-year-old Ryan, and the family roots hard for the four-time Super Bowl champion New England Patriots. To most of the world, they are Asha, Henry, and Stanley Crenshaw, cousins, teenage heirs to the massive Crenshaw Family Foods empire, and sole survivors of the tragic, and suspicious, explosion that wiped out the entire Crenshaw family — except for their beloved Uncle Fletcher. To the forces of greed and chaos, however, they are the Mighty Magical Majestics, keepers of ancient mysteries and defenders of civilization. 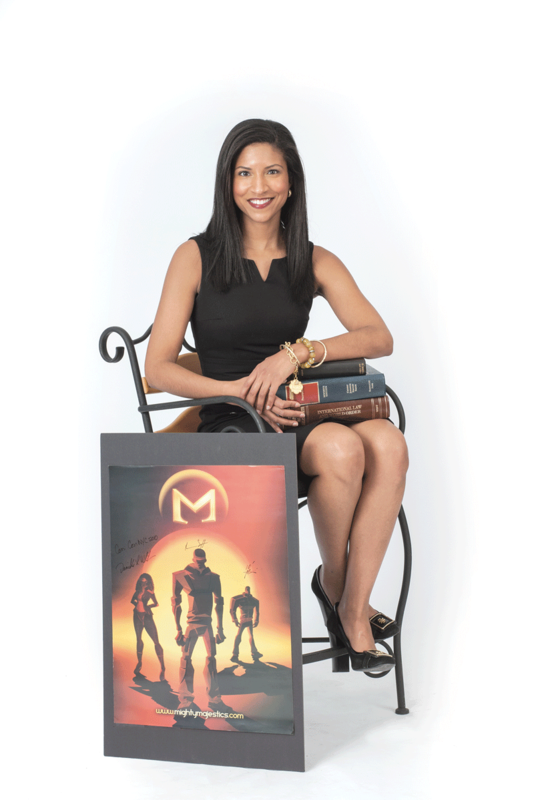 And they are a product of the imagination possessed by Danielle Williams — by day an attorney with the Northampton-based firm Fierst, Kane & Bloomberg LLP, specializing in litigation, housing, and intellectual-property law — and co-creator Armani Barake Scott. In the partners’ first Majestics comic book, Anubis Plague Part 1, the young superheroes head to the Midwest in hopes of finding answers to a pattern of powerful and very suspicious storms that are destroying industrial farms and killing herds of cattle. As the title suggests, there is much more to this saga coming — another three parts are planned, said Williams, adding that, as she and Scott continue writing — they share those duties and together decide plot lines — they are also working on a webisode based on their concept. While continuing to develop the Majestics through GADA, the entertainment company created by the partners, Williams continues her law career, one that began with her battling crime in a different way — as an assistant district attorney in Hampden County — before she followed a friend’s advice, moved to New York City, and began mixing legal work with creative writing. She returned to Western Mass. several years ago, and has become active in the community she has always considered home. She is a founding board member and board secretary of Veritas Prep Charter School, a member of the MacDuffie School Advisory Board, and vice president of the Greater Springfield Chapter of the Links Inc. She has also done volunteer work with PeaceJam New England and the United Way of Pioneer Valley — efforts that are heroic in their own way. Eric Lesser likened it to being equipment manager for the 2004 World Series-winning Boston Red Sox. Obama, Lesser, and the rest of the campaign team visited 47 states and logged 200,000 miles that year. Since then, he hasn’t traveled nearly as much, but he’s certainly covered a lot of territory, figuratively speaking. Indeed, after forging a relationship with Obama’s eventual senior advisor, David Axelrod, during the campaign, Lesser went to work for him in the White House, occupying a desk just a few feet from the Oval Office during a critical, intense time in the nation’s history, one defined by the Great Recession and wars in Iraq and Afghanistan. He would later become director of Strategic Planning for the White House Council of Economic Advisors before enrolling in Harvard Law School in 2011. As he pursued that degree, he became a father (daughter Rose is now 21 months old), was hired as a technical consultant to the HBO series Veep — “they’ll e-mail me scripts, and I’ll make sure everything sounds good and is realistic” — and eventually decided to pursue public service on another level. Indeed, in the spring of 2014, he announced his intentions to seek the state Senate seat being vacated by Gail Candaras, and in November he triumphed in a hard-fought election, becoming the youngest of the state’s 40 senators. 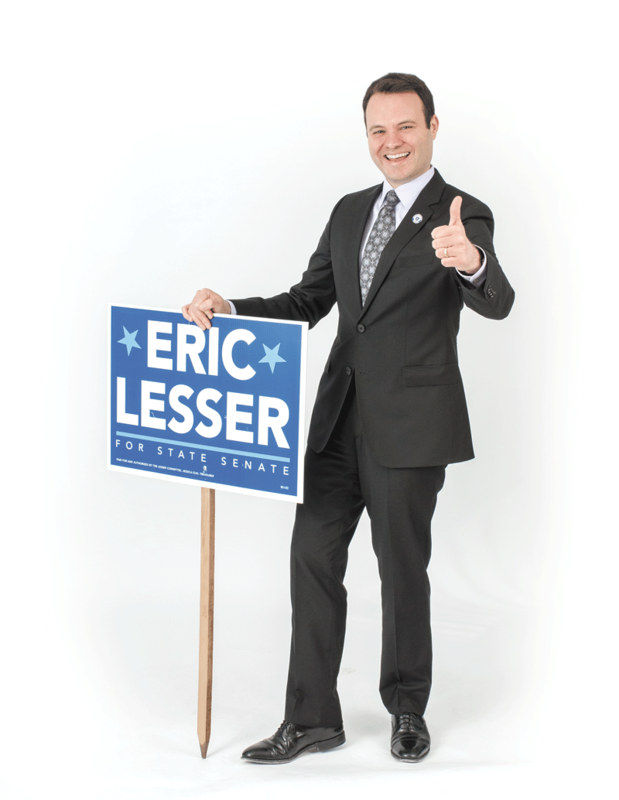 Today, Lesser is focusing his efforts on the issues that dominated his campaign, the battle against opioid abuse — he’s been named to the Senate committee addressing that issue and has written several pieces of legislation to confront the problem — and economic development, especially efforts to revitalize the region’s manufacturing sector and retain young talent. Those run the gamut from underage pregnancies and abortion to end-of-life calls — some of the most complex, wrenching, and emotionally charged cases doctors face. Today, that’s the role he plays as a clinical ethicist at Baystate. Not many hospitals employ a full-time ethicist, but DePergola thinks the role will become more common in the next decade or so. His own job is multi-faceted, from speaking with families to training medical students in ethics to helping formulate hospital policy on various individual and public health issues. DePergola also lectures at Elms College, teaching nursing students about healthcare ethics, business and MBA students about international business and global ethics, and theology students about how ethics applies to religion. He returned to the idea that, despite the critical issues his patients face, his job is a privilege. “I’ve spent a lot of time with individuals who are facing the most difficult times of their lives. Many end up dying. But they’ve taught me about living and all the things that make life valuable and worth pursuing.